The St. Louis County Library, Alzheimer’s Association, and Maturity and Its Muse will present “Exploring Alzheimer’s: Lived Experiences” at 6pm on Tuesday, August 28 @ 6pm, Library Headquarters, 1640 S. Lindbergh 63131. 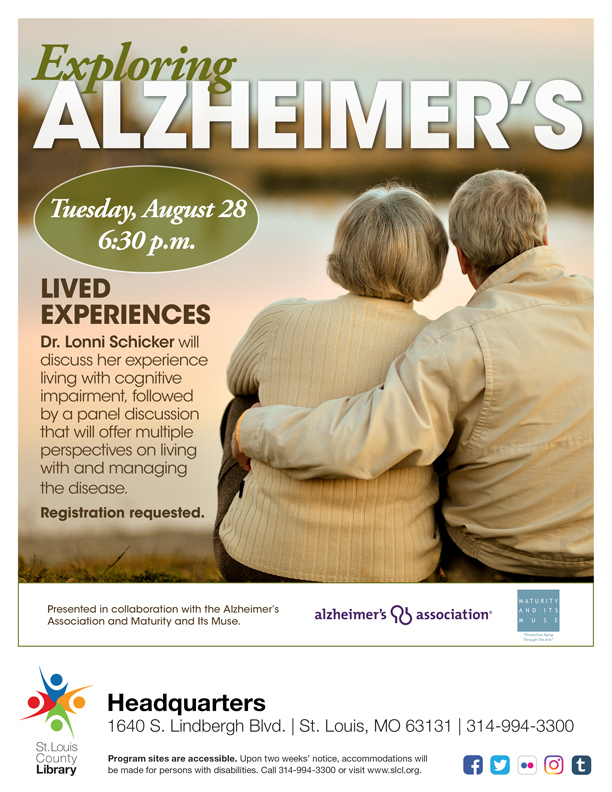 There will be a presentation by Dr. Lonni Schicker (recently featured in St. Louis Post-Dispatch). The evening will include a panel discussion and a Q & A. Seating is open. Admission is Free. Reservations are requested. Please share the attached flyer with those you think might have an interest in this special program.